DUE To Host by: May 31st, 2018 (due in my hands by this date!) SIGNUPS NOW CLOSED for this MONTH. Donations to help this art community are gladly welcome and accepted! If you do donate please be sure to put your USERID so I know who to thank!! You can see the supplies wishlist by clicking on this Amazon wishlist link. These are supplies that are used regularly each month in the packaging of everyone’s envelopes. Or you can choose to donate via paypal. Just —> Click this link and uncheck the goods and services box to paypal donate. 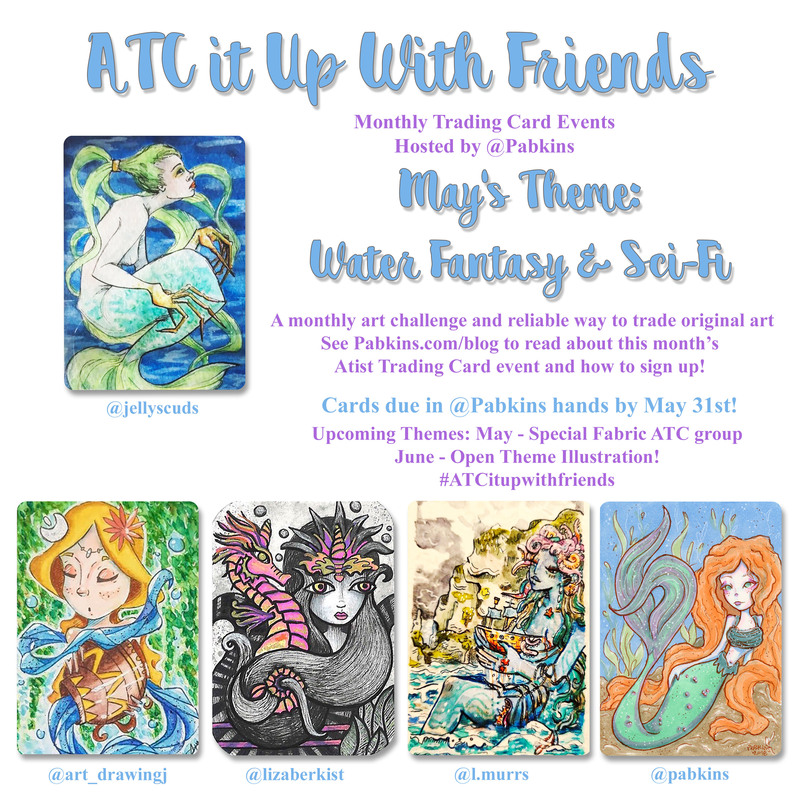 May in the social media art world is notorious for being #MerMay but did you know there are SO MANY OTHER fantasy and science fiction water based creatures and contraptions? Here is a fun list of examples and suggestions to get your inspiration going. I hope that folks will try to include things other then just mermaids so that we can have a wide variety of cards! Some examples of fantasy and sci-fi type things related to any body of water: selkies, kelpies, kappa, swamp witch/hag, frog/bog monsters, water fae, water elementals, undines, kraken, grindylow, naiad, sea serpents, nessie, mermaid, hydra, murloks, naga, bukanawa, gashadokuro, gasha, mash any water or sea creature with a human, mash any animal to a sea creature, try searching any folklore for water creatures and monsters and there are lots! Water means ANY body of water, rivers, lakes, ponds, sea and it can be above or below the water! Such as underwater cities, underwater scifi exploration vehicles, anything steampunk or robotic on or above the water, fantasy or scifi adventures ON or below the water. Please have fun and be creative. Remember I try to swap based on effort, detail AND composition. So if you send all portrait head shots that is what you will get back. – SENDING EARLY IS FINE! SENDING LATE IS NOT! It is upon my discretion to return late cards back to the artist’s unswapped. If you are a constantly late mailer I will start returning your cards unswapped. Please extend me some respect by mailing in a timely manner! – Optional: – “Host Gift Card” for Pabkins! It’s just an extra 4th card in the same theme if you have time. Everyone that knows me knows I’m a CRAZY ATC addict. Running this group takes a lot of my time and effort so I don’t get to do as many personal trades elsewhere. So if you want to put a big smile on my ATC loving face send 4 cards instead of 3 and I’ll get to keep one – Yippeee! I literally do a happy dance when I get one! – Optional: – DONATIONS! – Hosting these monthly swaps costs money and I now no longer have a job so would appreciate any help you can give. Even if it’s just a stamp or $1! If you could spare any of the following to help ease my workload I’d appreciate it! a pack of Kraft 5×7 envelopes with notecards or a few quarters or dollar towards the envelopes I buy in bulk. The monthly group is now 40-65+ artists every month and those envelopes add up! 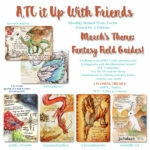 Any Extra ATC, any theme or even any you have laying around in need of a new home. Every month several envelopes go missing and I try to ensure no one goes with an empty mailbox. You can help me make that happen! Plus I recycle these back into the monthly returns as bonus extras when envelopes don’t go missing. Stickers or prints 5×7 or SMALLER! as I stick them in as “extra goodies” I cannot accept and will not mail back out anything over 5x7inches sorry. – All Cards must be RECEIVED by Pabkins on or before the DUE DATE! I try to give a short 5-7 day grace period if you’ve mailed out in a timely manner and notified me asap. It is up to my discretion to turn away artists that are constantly late in sending their cards, or if they rushed the quality. It isn’t fair to swap out your 1 hour rushed cards for ones others spent a fair amount of time on. Please don’t make me the bad guy. If it is postmarked the last day of the month or after I will return them unswapped regardless if they arrive before I mail returns. – ORIGINALS only! No prints, Do not copy someone else’s art, no copying images you found on the internet, no tracings, no stolen art, Create your own original work of art! Do NOT leave flat white backgrounds, this is not a rough quick piece of art, it should be a fully finished piece of art and you should be touching the entire surface of the card. If in doubt please reach out to me for feedback. Solid flat backgrounds are discouraged. Please put in some actual effort and try for a background on your card. Do Not send cards that shed! So no glitter! Glitter ink is acceptable as it does not shed, so if you like things to shine then grab yourself a glitter ink pen. They must be dry, and not smell strongly of chemicals! It is up to my discretion to return cards unswapped! Examples of when this might happen are if they: 1) arrive too late, were sent too late to go into the swap (or you’ve consistently been late each month, or were mailed on or after the DUE in my hands date!) 2) Do not fit the theme, Please read the THEME REQUIREMENTS! 3) show lack of honest effort or there are no comparable effort cards to swap them with, 4) they do not meet the size requirement, rough edges, poorly cut or 5) are damaged. Please do not make me the bad guy! – INDIVIDUALLY sleeve each card – document protectors, penny sleeves PREFERRED (see this link), or ziplock bag – just protect it as envelopes often get wet! LOST MAIL, LOST CARDS – I am not responsible for lost or stolen mail. If I do not receive cards I cannot swap out cards from the group swap. I try to make sure no one goes with an empty mailbox but I cannot do this alone as the group is too large. Donation cards for lost or stolen envelopes are appreciated. If I attempt to replace a lost envelope it will be solely upon my discretion and likely only if you are a longstanding member of the group. INCLUDE YOUR POSTAGE AND RETURN ADDRESS LABELS PLEASE!!!! self addressed stamped envelopes no bigger then 5×7 inches would be great but are not necessary – do NOT send envelopes larger then 5×7 as those require 2 stamps to mail! – INTERNATIONAL ARTISTS: please donate $1.15 via the Paypal friends and family method by clicking this link and you MUST UNCHECK the goods and services box or they will charge me to accept your funds! as an international postage stamp costs $1.15. – I SUPPLY: the return envelopes, sleeves and postage overages, Random prints, stickers, and sometimes extra originals. DONATIONS ARE WELCOME! Click this link to paypal donate! and uncheck the goods and services box! I attempt to mail return Envelopes back out within 7-12 days after the Due by date each month.